The stars of my winter garden are without question, the Camellias. Looking particularly beautiful this year, the big red Camellia in my back garden has just opened her first blooms and is covered in buds waiting to open. 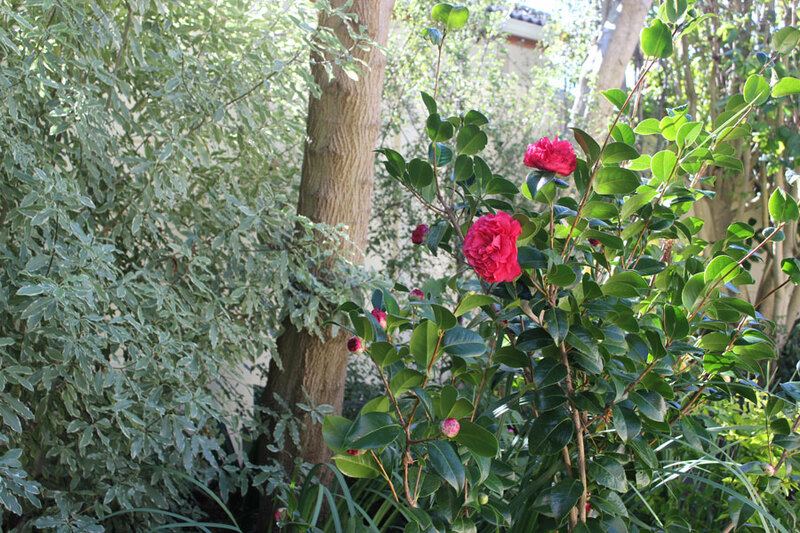 Tucked in amongst other plants and taller growing shrubs are the smaller Camellias shrubs, some of which are flowering for the first time this year. Their lovely pink flowers draw attention to the lower growing foliage, all of which is looking lush thanks to the rain. I’ve been battling a bit to find ‘blogworthy’ things in my garden. We are having lovely winter weather right now, cold and crisp with sunshine and … my favourite … no wind! But a fair amount of rain has left some of the ground in my garden sodden and this makes gardening not entirely pleasant. I may need to look at the drainage in certain areas if it gets a lot worse. The “Two Gardeners” have both been sick …flu, sinusitis and then in case the first bout was not enough, flu again. We’ve both been out of commission, so visits to our friends’ blogs have been minimal. We promise to visit you again now that we are up and about. I will be linking this post to Helen of The Patient Gardener who hosts End of Month View. This monthly meme is where garden bloggers share their garden views for the end of the month. 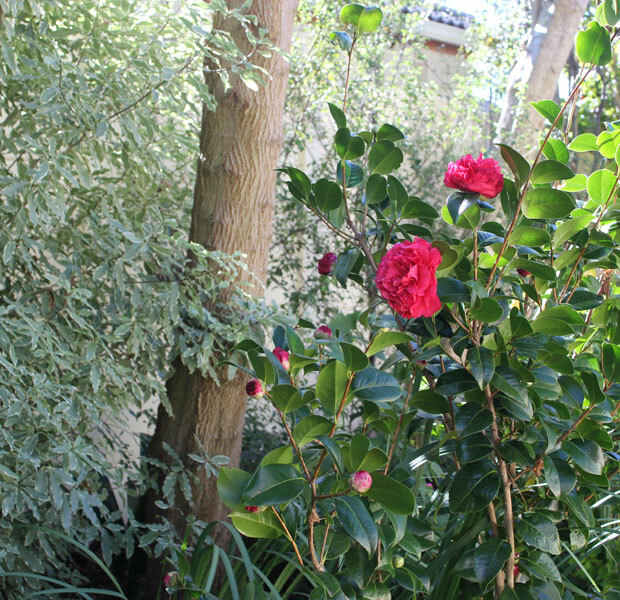 Thanks for such a lovely tour of your space, highlighted by camellia, one of nature’s great gifts; yours delight. I do enjoy visiting your gardens. I especially like your plant combinations. Rest and liquids is our cure for most of what ails us. Hi my friend – hope you are over the worst of it and feeling whole again. I love the lyrics you chose here ….till we find our place! The circle of life is so fitting here – the winters must come and through all this the spring will arrive. So much to look forward too. I have had a weekend of garden clean up! I will post this today, so you can see what I have been up to since the hibernation! 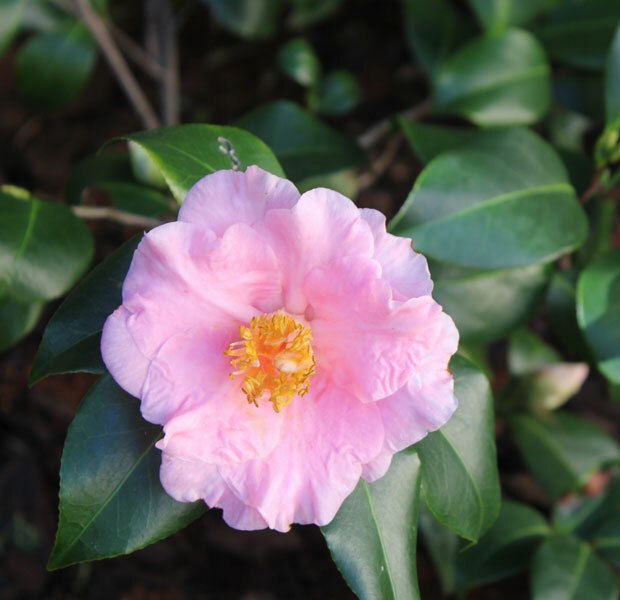 Your camellias are definitely stars! We can only grow them this far north if we have a greenhouse (we don’t). But I have always loved them! Hope you are both well over the flu. Maybe your sodden bit could become a bog garden? Arums and vlei lilies? Even the waterblommetjies actually grow in shallow pools of winter rain. Very inspiring post. Its hardly rain here in the month of June and I am terribly waiting for the rainfalls this summer. Thanks for visiting my blog. How nice to have glimpses of spring even as winter just begins for you. I envy your mild winters, and your Camellias (which we can’t grow here)! I’m so sorry to hear that you have both been sick–I hope you’re feeling better now. 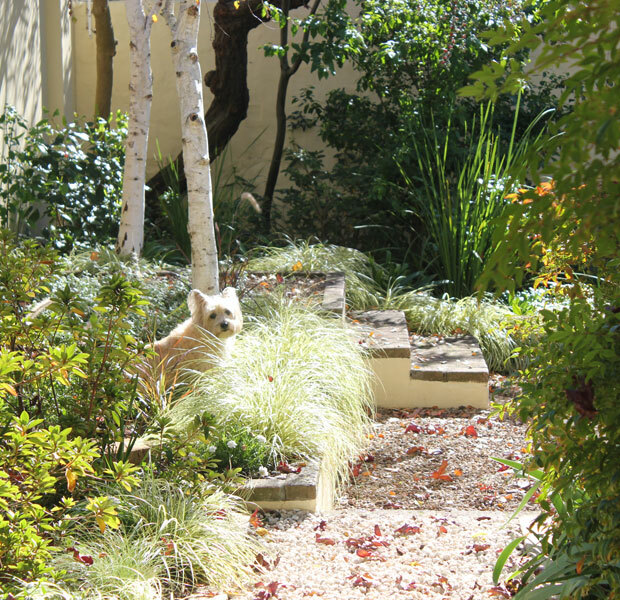 Great shot of your garden with the pup looking over the grasses. Very sweet!